Building Vineland, New Jersey from a Vast Wilderness ~ The History Girl! Just shy of 150 years, the Vineland Historical and Antiquarian Society in Vineland, New Jersey, has been documenting and collecting mementos of its rich past, beginning just three years after Vineland's founding in 1861. Only a few miles from present-day Route 55, this city, the largest in terms of land-area in New Jersey, has been at the forefront of women's rights, innovation, and diversity since its founding by Charles K. Landis. Because of the foresight of its founder and early residents, the City of Vineland contains a museum and archive building packed with thousands of objects, photographs, and documents, telling the story of its development. Landis Avenue, Vineland, NJ looking east. Charles Kline Landis was born March 16, 1833 in Philadelphia to Michael G. and Mary L. Landis. 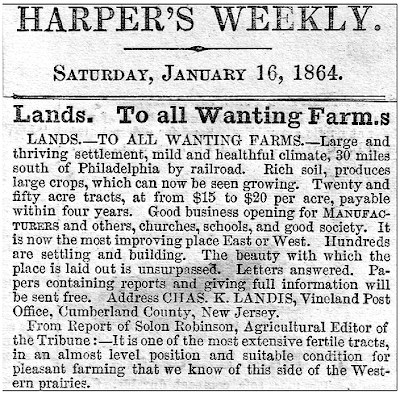 Charles was educated as a lawyer and one of his first investments, in 1857, with his law partner, a man named Byrnes, was the purchase of 5,000 acres in what is today Hammonton. After just three years, Hammonton had over 2,000 inhabitants, and was a successful agricultural community along the Camden and Atlantic Railroad. Landis purchased 30,000 acres in Cumberland County, New Jersey in 1861 along a newly completed railroad, roughly forty miles south of Philadelphia. Landis was twenty-eight and full of ambition. His dream was to create a thriving, self-reliant community where none had previously existed. Surrounded by relatively flat, fertile virgin land for miles, he conceived a square mile town center with industry, commercial interests, educational facilities, and a residential component, surrounded by farms, gardens, orchards, and vineyards, "...as far as the boundaries would reach." In order for this investment to be profitable, Landis immediately began to develop a plan for his community in the wilderness, laying out streets, marking lots, and advertising a community that would embrace nineteenth century utopian ideals. Landis felt that a community should cater to the needs of its citizens socially, financially, and intellectually. Because of the fertile soil, excellent for growing crops and grapes, Landis called the square mile town the Borough of Vineland. The surrounding acreage which was used for farms and gardens, was incorporated as Landis Township. Landis banned the sale of alcohol in Vineland and required that all who purchased land settle it and not resell the land for profit. According to the stipulations on the deed, a house would need to be constructed within a year of purchase, 2½ acres of the often-heavily wooded land had to be cleared and farmed each year, and all houses were to be adequately spaced from each other and the road to allow for the planting of flowers and shade trees. 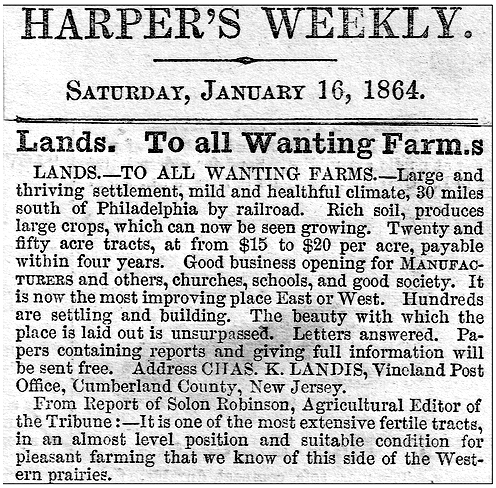 Harper's Weekly Advertisement, January 16, 1864. As the town established itself, numerous industries moved to Vineland. The glass industry, which had been prospering in towns such as Bridgeton and Millville, opened operations in Vineland because of its rich supply of silica sand. In 1897, Victor Durand Sr. established the Vineland Flint Glass Company, which was later run by his son Victor Durand, Jr. The company produced scientific and clinical glassware. In the 1920s, the company shifted to decorative art glassware. Over twenty smaller companies and artisans set up shop in Vineland and produced glassware for a number of household, scientific, and decorative purposes well into the twenty-first century. Other notable industries in Vineland included various textile and shoe factories, the Thomas Hirst Rug Factory, a flour mill, foundry, and Welch's Grape Juice Company. A Dr. Thomas B. Welch moved to Vineland in 1865 to establish a dental practice. He later opened a dental depot in Philadelphia but is best known for developing a method to preserve wine in an unfermented state. In 1869, he protested against the serving of wine at communion at the Vineland Methodist Episcopal Church. He was told by church officials that he could provide whatever he wished as an alternative and created "unfermented wine." His "unfermented wine" sold for over twenty years under this name before it was changed to grape juice. Welch's Grape Juice Company was officially launched in 1893. For many years, most of the world's supply of Welch's Grape Juice was produced in Vineland. Beginning in the early 1900s, the company began moving its operations to New York State and several other grape juice manufacturers opened in Vineland, including the Vineland Grape Juice Company, Breck's Grape Juice, and Duffy's Grape Juice. Artifacts from Welch's Grape Juice Company and other Vineland-based grape juice companies. Politically, Vineland has been viewed as a progressive city. In 1868, a local suffragist named Sarah Pearson distributed a handbill that urged women to cast symbolic ballots in that year's presidential election. Thus, Vineland was the first place in the nation where women voted in a presidential election, even though the results were not officially recognized by the government. Around the same time, bucking fashion and etiquette trends, resident Susan Fowler walked the local streets of Vineland wearing pants. Her unusual behavior attracted visitors to the city from across the United States and made her the topic of political cartoons. Fowler traveled across the eastern United States promoting equal rights for women. Even well-known suffragists Lucy Stone and Susan B. Anthony spoke in Vineland, in 1867 and 1868, respectively. Landis helped to nurture the egg industry in Vineland. He believed that raising chickens could be done year-round by almost anyone, regardless of skill or strength. Landis helped locals grow their business by controlling the market. He shipped the eggs directly to buyers in Philadelphia, eliminating the local middlemen. By also controlling the feed market and opening his own feed mill, he drastically reduced prices and enabled more than 1,000 new henneries to open. Poultry became a successful industry and many Italian and Jewish families raised chickens and sold surplus eggs to market in Philadelphia and New York. Due to the success of the industry and the Vineland egg label, the largest egg auction in the country opened in 1931. In the 1950s, almost a million eggs a day moved through the Vineland Egg Auction on Delsea Drive. Due to a decline in the poultry industry in the 1960s and economic recession, the auction closed in 1973. A Vineland, NJ poultry farm. Vineland's town father, Charles Landis, did not escape controversy during his tenure. Landis and his wife suffered a devastating loss in 1869, when their firstborn son died after only a month. There were rumors of marital discord in the Landis family. Despite the setback in his private life, Landis heavily pursued his dream of an ideal town. He worked tirelessly, often fighting state officials who presented obstacles in his path and naysayers who said he would not make Vineland the success he envisioned. One of those naysayers was Uri Carruth, editor and publisher of the Vineland Independent newspaper. He often published personal attacks against Landis and his family. In the March 18, 1875 edition of the Vineland Independent, Carruth published an article hinting that Landis wanted to commit his wife to an insane asylum. Although he did not use their names, it was inferred. This was the final straw for Landis. He deliberately and calmly walked into the Independent's office and, according to witnesses, shot Carruth in the back of the head. Carruth lived for seven months before he died of the wound. Landis was jailed and faced trial in Bridgeton for murder. There was debate whether the gunshot wound or the doctors who probed the wound, caused Carruth's death. Landis' defense stated that he was suffering from temporary insanity at the time of the crime. The jury returned a verdict of not guilty by temporary insanity and Landis walked away free. However, his life was never the same after the trial. Landis was constantly depressed and remained that way until his death on June 12, 1900 at the age of sixty-seven. He is buried in Siloam Cemetery in Vineland, a cemetery that was established on land he donated in 1864. A painting of Charles K. Landis hangs (center) at the Vineland Historical & Antiquarian Society. Much of Vineland's history is preserved at the Vineland Historical and Antiquarian Society located a block from the downtown. The Society was founded in 1864, only three years after Vineland was founded. The original building for the Society was a one-story, wood-frame and brick structure. The main room of the building was laid out in a perimeter design, so that the center was open for hosting lectures. Bookcases, filled with literature on local and national history, lined the interior walls. The Society remained in this building for about seventeen years, until 1910, when construction began on a much larger structure. As early as 1893, John S. Shepard and Daniel F. Morrill donated money for the Society to secure a lot and building on South Seventh Street. In his will, Charles K. Landis included a substantial bequest for the Society to use toward securing funds for construction. By 1910, all funding was finalized and construction began. The building was designed by architect George E. Savage and built by local builder James D. Pasquale. The building was finished in 1911 and since then has been expanded several times, as the Society's collections continue to grow. Today, the Vineland Historical and Antiquarian Society continues the mission that began almost 150 years ago. The main room is still used for meeting and lectures, while the perimeter and adjoining rooms are used for exhibits on industry, notable residents, and milestones in the city's history. With each day that passes, another entry into Vineland's rich history is made and will continue for many years to come. Hey History Girl/Kelly: I'll have to do some research on this, but my great-grandfather was part of the Vineland Historical Society during his years there as a Baptist minister. Thanks for an interesting article about the beginnings of Vineland.